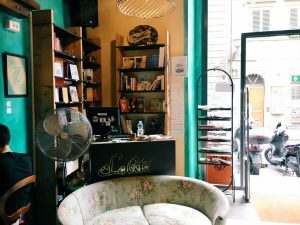 One of the best places in Santo Spirito to just sit down and enjoy a book or get some homework done is La Cite. This cute little cafe doubles as a library! During the day you can enjoy a sandwich or a brownie with a cappuccino, but if you come back later you’ll see that the place has been turned into a quiet bar! This is the best study spot I’ve found in Santo Spirito because not many people know about it! It is located just a block off of the river so not many tourists take the time to wander down this quite street. Grab a book and take a seat! 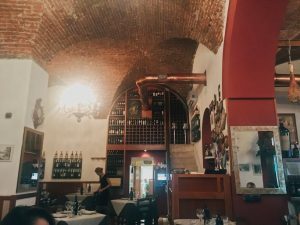 Dante’s is my favorite restaurant in Santo Spirito. They have a wide variety of pastas and pizzas that fit perfectly within the budget of a student studying abroad. My favorite thing on their menu is the Fettucini Alfredo – it reminds me of something that my grandmother would make for us at home! Another great thing about Dante’s is that they understand students don’t have a ton of money, so all FUA students get free wine and don’t have to pay the service fee! Just mention to their incredibly friendly staff that you are a FUA student and they’ll take care of the rest! 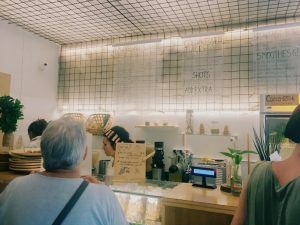 La Carraia is known for being the best gelato in Florence, and it lives up to the hype! This cute and small gelato shop is packed every night of the week, but for 2 Euro cones it’s worth the wait. My favorite flavor is salted peanut because it tastes just like peanut butter, but they also have at least 19 other amazing flavors! “Yogurt and Nutella” is another popular flavor because it’s a combination that doesn’t sound like it will work, but it definitely does. 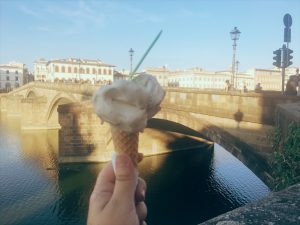 The location is perfect because once you get your gelato you can cross the street and sit by the river to enjoy the incredible views of Florence while you finish your cone. Raw is another great place to study, especially if you’re looking for something fresh like a smoothie or an Acai bowl. This place is a little more pricey but worth it for the fresh fruit and chic environment. My roommates and I go here all the time, especially when we need a break from all the incredible pasta and pizza that Florence has to offer. Despite being a bit off the beaten path, Raw always has a steady flow of people coming in! If you sit in the back room you can enjoy a quieter part of the store and the free wifi they provide! Piazza Santo Spirito is the best place in all of Santo Spirito! In the mornings the square has an amazing market with fresh produce and other things like clothes and shoes. The square is lined with incredible restaurants and bars, and the steps of the church at the front of the square are where all the locals go every night. 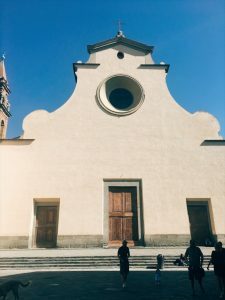 Grab a bottle of wine with your friends and head over to Piazza Santo Spirito to sit on the steps, relax, and chat with the locals. Sit on the steps of this church at night!